I'll start with another cute photo of Amiri. It might seem that Amiri is appearing on the front page an unfair number of times, but he's going to have to leave the area in not too many more months, so I'd like to get in as many photos as I can while he's still here. Dexter is still occasionally sleeping in Box 1 or 3, and one of the other males (Baxter or Deckard) has also recently been seen in the box 3. 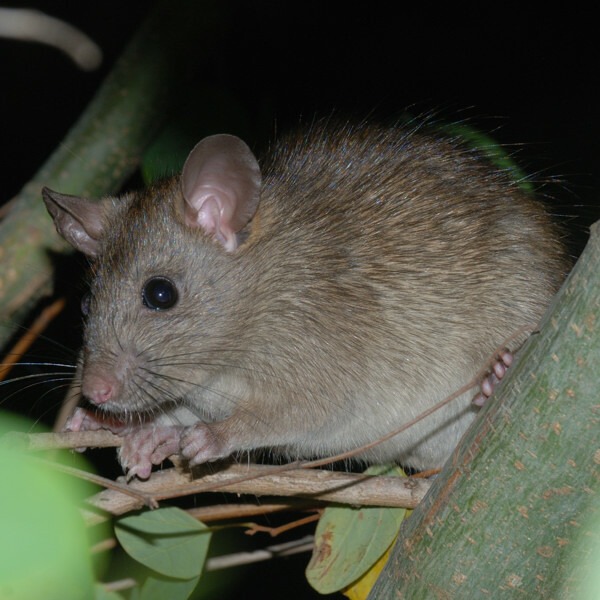 None have visited the house, although one of them (probably Dexter) has recently been seen high up in a Chinese Elm, sampling the new buds which seem to be a choice food for possums at this time of year. When last seen, Dexter had a nasty bite wound on the back, Baxter had an infection around his eye, and Deckard had just been in a fight with Dexter, so I've been hoping for at least one of them to come close enough that they could be inspected for wounds and treated if necessary - but no luck on this so far. A carpet python (quite likely the 2 m one seen in August) came to check out the ceiling space where Baxter had been trapped. Scruffles was in the ceiling space at the time, but escaped being eaten. I finally got around to replacing the notoriously bad Box 2 camera. 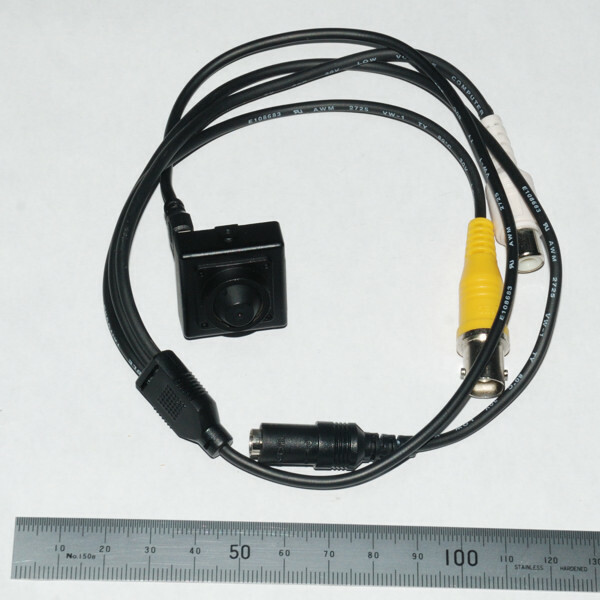 The details of this might be mildly helpful to anyone setting up their own box cameras, but are unlikely to be relevant or interesting to anyone else. 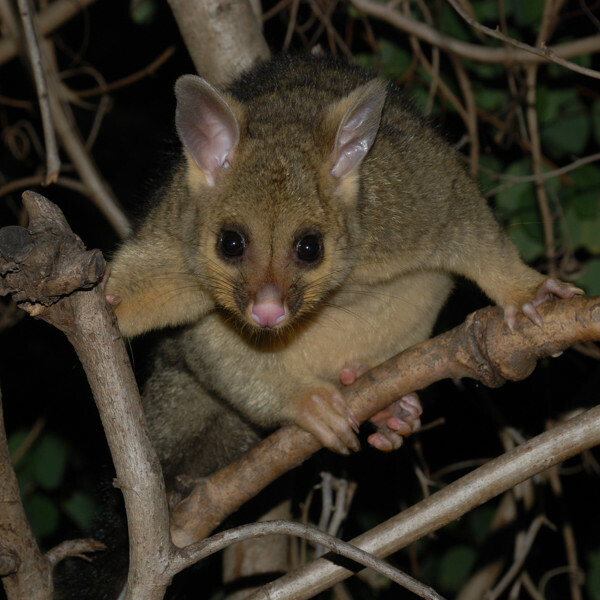 So if you're reading this blog just because you're interested in possums, you can skip the rest of this post without missing out on anything. Replacing the camera was a relatively big job because the old camera had an integral 20' cable, which meant I had to pull in new cabling along with replacing the camera. I also made a number of other improvements. 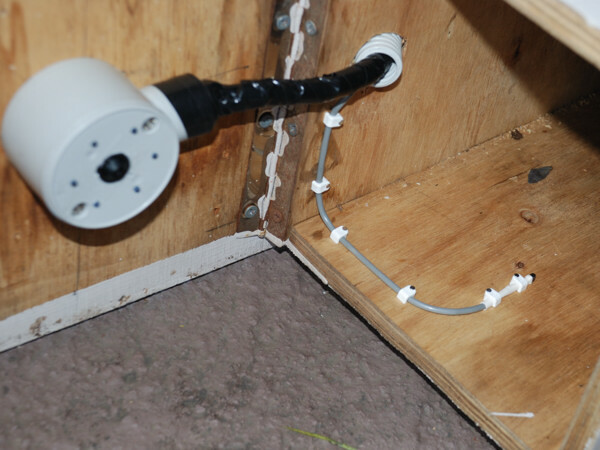 I decided to change the way the cable entered the box; rather than simply having the bare cable entering under the roof of the box, I used flexible conduit to go via a junction box on the back of the box. The effect of this is that the cabling is completely protected from the weather, but can also be detached without having to open the box. 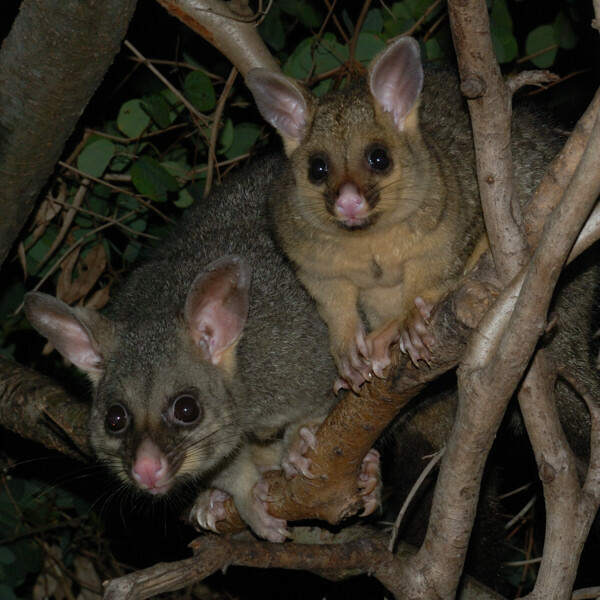 This means that if there's a sick possum in the box, the box can be taken down from the tree and transported to a vet without having to disturb the possum or cut the cable. I've never actually had to do this, but I think it's a good feature to have just in case. The new camera was billed as a "pinhole camera". It isn't technically a true pinhole camera, but simply has a very small lens. 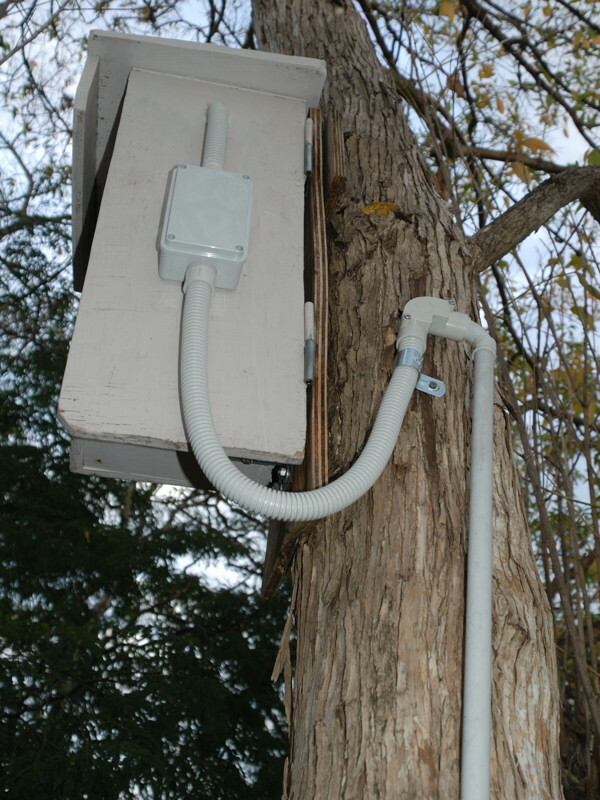 I chose this type of camera because box 2 is very small and possums often come very close to the camera. This means that the camera needs a very large depth of field to keep the possum in focus. Supposedly, the smaller the aperture of a camera lens, the greater the depth of field, with a true pinhole camera having theoretically an infinite depth of field. So this camera should have been ideal. It turns out that the picture is fairly fuzzy anyway, so I might as well have used a standard camera. 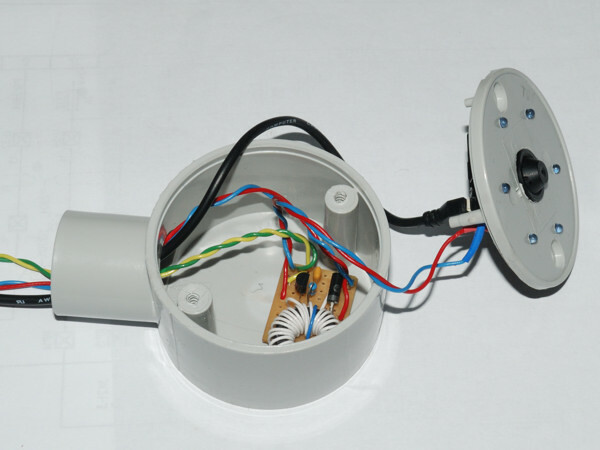 I mounted the camera inside a circular junction box, rather than simply screwing it to the ceiling of the box. This was mainly to protect it from being knocked out of alignment by inquisitive or fighting possums. The box itself was in fairly good condition, despite having been in service since 2005. Although it was still perfectly sound, the roof of the box had been somewhat affected by the weather, so I decided to give it some additional protection. I first scrubbed the top with bleach to discourage mould from developing, then attached some scraps of Hardiflex cladding to it with building adhesive. This was then painted over with Solaguard. Another thing I did was to place a temperature sensor inside the box. I sometimes wonder when I see a possum lying on its back in a box, just how hot it is in there. My intention is to display the box temperature on the camera alongside the date and time, but it's going to take a bit of time to set this up. Thank you, it was very interesting for us to read. And we look forward to the temperature sensor data :). Glad Scruffles survived that python! I think our Mr/Ms Thief may have fallen victim to the python who spent a few days on our outdoor bathroom wall last week. I've just hooked up temperature monitoring for box 2 tonight. You can see the temperature displayed underneath the time in the bottom right corner of the picture. It's a bit of a temporary setup for testing purposes and the sensor hasn't been calibrated yet, so don't be surprised if it displays weird numbers or disappears at times. It was a bit scary to read about the python lying in wait right under where Pouch 2 was playing. Hopefully it was just waiting for something to come along at ground level and not actively stalking the possums. For some bizarre reason the people who owner built our place dumped the kitchen sink drainage pipe just outside the house. They planted a wonderful wetlands area to soak it up - and then built an outdoor bathroom next to it! The lovely puddle of water at the end of the pipe has of course become the main antechinus watering hole and attracts snakes etc during dry weather. We keep meaning to lengthen the drainage pipe but because it means a lot of digging it's one of those things we put off. So Mr Snake was probably there for the antichinuses, but if a possum joey fell from the bathroom gutter above I'm sure the snake would not say no. The python has been there three nights now. Louisa and Pouch 2 were there for two. 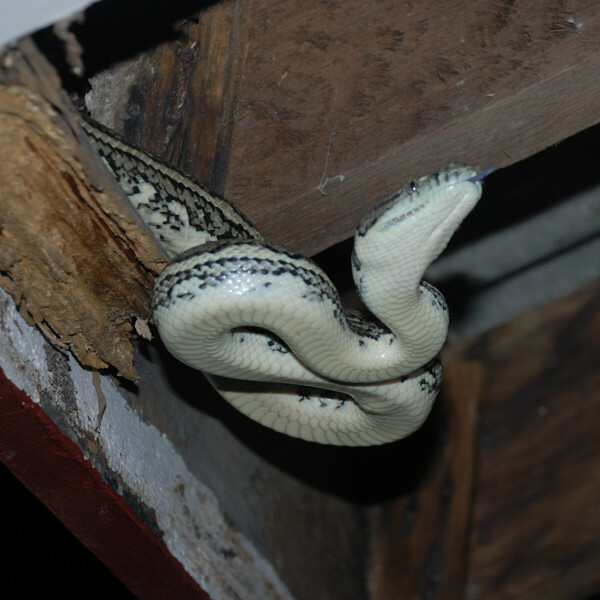 Hopefully the cooler weather will encourage the python either back into our roof or a bit further away!